Property Location Located in Kassandra (Halkidiki), Anemos Hotel is within the vicinity of Pefkochori Pier and Kalithea Beach. This aparthotel is within the region of Pefkochori Lagoon and Folklore Museum of Afitos.Rooms Make yourself at home in one of the 10 air-conditioned rooms featuring kitchenettes. Rooms have private balconies. Complimentary wireless Internet access keeps you connected, and satellite programming is available for your entertainment. Conveniences include refrigerators, and housekeeping is provided daily.Dining A complimentary breakfast is included.Business, Other Amenities Free self parking is available onsite. 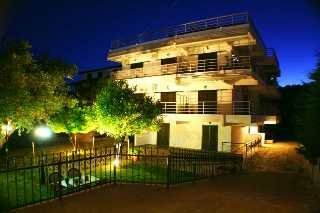 Alkionis studios is situated in Kallithea, a lively and popular destination in Kassandra, Halkidiki. Just 100m from the center of the village and only a few minutes walk from the sandy and dreamy beach. Alkyonis Studios offers its customers good services, comfortable accommodation and friendly hospitality. All rooms are spacious and fully equipped. Distance from the Beach: ca 200mDistance from the Airport: ca 80 kmDistance from the nearest village/town: ca 100m from KallitheaAdditional information: Cleaning: dailyLinen Change: every 3 daysTowel Change: every 3 daysBeach description: public, sandy,beach bar, sunbeds and umbrellasBus stop: ca 200mATM: in the village The images shown here serve to give a general impression of the hotel. The facilities may be slightly different from these examples as well as the names of the room types. Property Location With a stay at Medusa Hotel in Kassandra (Halkidiki), you'll be within the vicinity of Kalithea Beach and Folklore Museum of Afitos. This hotel is within the region of Pefkochori Pier and Pefkochori Lagoon.Rooms Make yourself at home in one of the 51 guestrooms. Rooms have private balconies.Rec, Spa, Premium Amenities Take advantage of recreation opportunities including an outdoor pool and bicycles to rent. Additional features include complimentary wireless Internet access, a television in the lobby, and tour/ticket assistance.Dining Enjoy a satisfying meal at a restaurant serving guests of Medusa Hotel. Relax with your favorite drink at a bar/lounge or a poolside bar.Business, Other Amenities Featured amenities include limo/town car service, multilingual staff, and a safe deposit box at the front desk. A shuttle from the hotel to the airport is provided for a surcharge (available on request), and free self parking is available onsite. Hotelul Melissa, o afacere de famiie, este locul ideal pentru petrecerea unor vacante de neuitat. Este format din 4 cladiri principale si isi intampina oaspetii cu o atmosfera calda, primitoare, punandu-le la dispozitie servicii de calitate. 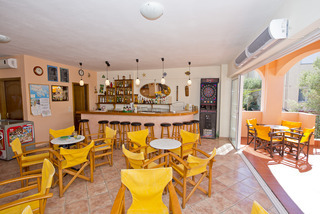 Hotel Calypso is a family owned resort, two star (2*) hotel perfectly located in the center of Hanioti village, with easy access to the bars, restaurants, shops and only 150m from the organized beach. The hotel is beautifully positioned and extremely comfortable with its own pool in a large terrace with sun-beds, umbrellas and all amenities, which gives the feeling of privacy and relaxation. Hotel Calypso is decorated with the traditional Greek architecture and has been lovingly restored to Hanioti’s finest and most characteristic hotel. The hotel combines wood and stone in natural colors in such a way that creates a cozy and friendly atmosphere.The hotel offers 77 rooms (3 single, 60 double and 14 triple rooms).Distance from the Beach: ca 150mDistance from the Airport: ca 85 km Distance from the nearest village/town: in the villageAdditional information: Cleaning: dailyLinen Change: twice/weekTowel Change: 3 times/weekBeach description: sandy beach with clear blue waters, combining the perfect traditional and cosmopolitan holiday imageBus stop: ca 100mATM: ca 100m The images shown here serve to give a general impression of the hotel. The facilities may be slightly different from these examples as well as the names of the room types. Korali House is situated in Neos Marmaras, Sithonia Halkidiki. 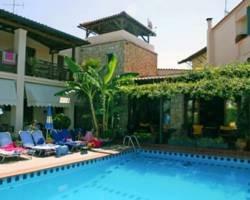 It is a family run business and offers studios with a panoramic view of the sea, village and the harbor. All studios have two or three standard beds (with the possibility of putting one extra camp bed), new fully equipped kitchens, fridge, TV, A/C, WC/shower and balcony with view to the sea or the village.There is free Wireless Internet connection in all units and public areas. There is also available barbeque with a big kiosk overlooking the port of Neos Marmaras. Studios are cleaned daily & linen changed every 4 days.Distance from the Beach: ca 700m from the beachDistance from the Airport: ca to 108km from Thessaloniki International AirportDistance from the nearest village/town: 50m from the center of Neos MarmarasAdditional informationCleaning: dailyLinen Change: every 4 daysTowel Change: every 3-4 daysBeach description: There are small rocky beaches circa 200m away and the big sandy beach of Paradisos about 600m away.Bus stop: ca 150mATM: ca 200m The images shown here serve to give a general impression of the hotel. The facilities may be slightly different from these examples as well as the names of the room types. Localitatea mica Loutra este situata departe de atmosfera prea plina de viata a celor mai renumite statiuni din Halkidiki si la doar 120 km de aeroportul international din Salonic. Acest sat va va permite sa combinati relaxarea, experienta spa termala cu viata de noapte in statiunile vecine în vacanta. Satul este inconjurat de stanci si pini, ceea ce il face un loc ideal pentru ciclism montan si drumeții. Alegerea cailor de ciclism este limitata numai de imaginatia ta. Kassandra Bay Village, located 400 meters from the beach and just 800 meters from Kriopigi village. It is set on a hillside between the village and the beach. Guests can start their morning with a buffet breakfast. Refreshing drinks and light meals are served at the bar and snack bar. The à la carte restaurant prepares various dishes throughout the day.Free sun loungers and umbrellas surround the pool. 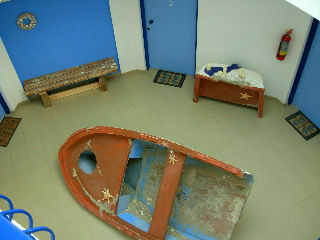 A playground area and paddling pool are available for children. Wi-Fi access is complimentary in all public areas.Distance from the Beach: ca 400mDistance from the Airport: ca 75kmDistance from the nearest village/town: ca 800m from KriopigiAdditional information: Cleaning: dailyLinen Change: 3 times/weekTowel Change: 2 times/weekBeach description: public, sandy, sunbeds and umbrellas.Bus stop: within 850mATM: in the village The images shown here serve to give a general impression of the hotel. The facilities may be slightly different from these examples as well as the names of the room types.